Livi Machicnery is one of the most famous poultry farming equipment industry in China. 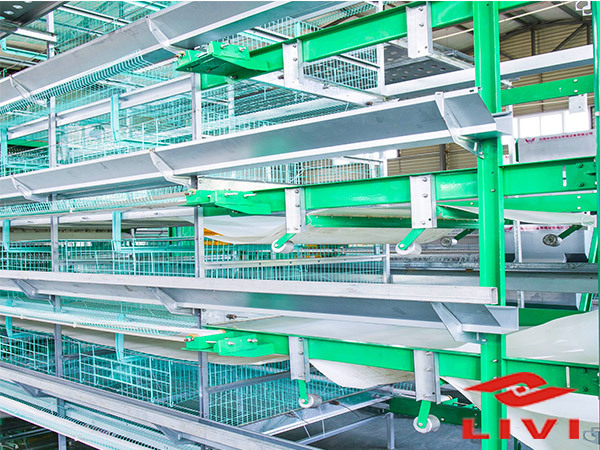 In recent years, we have contributed to the poultry farming enterprises and manufacturers in the product of poultry chicken cages system. With the rich experinence of developing and researching chicken cage production, we have developed into the integration of research and produce poultry chicken cage center. The chicken poulty product are mainly contain egg production and meat for people’s daily protein and nutrition. Thus, the necessity of great poultry chicken cage system would helps a lot. Chicken cage system in our machinery include the automatic layer rearing equipment, automatic pullet rearing equipment and automatic broiler rearing equipment. Each of poultry rearing equipment can satisfy your requirements in the chicken breeding process. As is known to most poultry farmers, the chicken cage equipment of cage mesh include cold galvanized, hot galvanized, aluminum zinc alloy and electrostatic spraying. Our chicken cage production adopt the anti-corrosion treatment process of electrostatic metal technology, which can effectively protect the product of poultry chicken cage system. It is a perfect poultry breeding mode in the construction of large-scale and intensive healthy feeding system. There are some aspects in reducing the cost of poultry chicken cage system. For the reason of automatic poultry chicken cage system, automatic drinking system, automatic feeding system, automatic manure removal system, automatic environmental control system and poultry management system, the rising cost of labor and energy can be saved largely. We believe the advantages of poultry chicken cage system in our poultry rearing equipment industry will be further reflected for the above features as well as long service life for the whole cage system and high space utilization for poultry chicken shed that we can give you the good poultry plan for you. Please take a look for our poultry farming cage system production at your convenience.